First day of classes fun!! 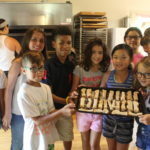 Yum, cooking class! Good work! I’m happy! and I’m singing! Because I’m happy!! It’s the first day of classes and I am SO excited to get things started back up again. There are SO many fun classes planned for today. 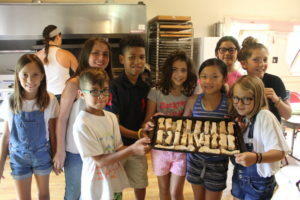 From the class, “Where the Wild Things Are” to “Woodland Secrets” to the cooking class, “Berry, Berry, Zestful Summer” to horseback riding to glass beads…my head is spinning with all of the activities going on! 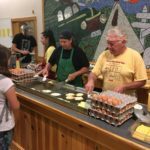 Today we started the day off right when we had an egg bar at breakfast…I’ll HAPPILY wait on line for those eggs of golden perfection. At morning meeting we were greeted by the Snack Scot (pictures below!) 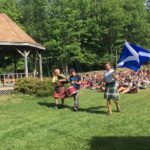 who told us about his journey from Scotland to make sure that all the campers got snack and put their trash in the proper receptacles. How funny it was to see Stephen in a kilt with the Scottish flag, and how cool it was to see Chris playing the bag pipes! We also heard from the Interest Group staff about all the fun activities happening at Interest Groups today. The Pool (fun!) is open!! What a morning! Last night was the lovely ceremony, one of my favorite evening programs if I had to choose, of Pine Grove. We all walked up in silence to the top of Tipi Hill where the tipis counselors, Cassie and Mckenzie, had a roaring fire prepared for us to sit around. How wonderful it is to sit around a campfire on tree stumps or nature’s floor and sing in unison…it truly brings a community together and is one of the most magical experiences I’ve had. There were SO many great acts…some were inspiring, some were funny, some were creative, and some were downright beautiful. Paquatahnee had us singing about the pros and cons of having a rickadandoo…it’s red and gold! and purple too! 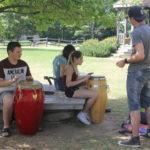 Halley’s Comet sang a beautiful cover of the “Bare Necessities” in which they changed the words to talk about their life at the horse barn as horse lovers! Love their passion! Chateau Fiasco had us all dancing to the “Nature Anthem” and it made me want to go climb up and down a mountain and be nice to everyone!! Wombles showed us their wacky side when they sang about their wackiness by changing the words to the macarena! The Burrow had us all goin’ bananas with their fun banana song! Yummy AND funny! Forbidden Planet had us all feeling what it’s like to be a penguin drinking tea. What a great workout it is to be a penguin!! Taj Mahal sang the sweet song, “Halo,” by Beyonce. It sounded so lovely to hear the whole camp singing it together! Treasure Island changed the words to the Spongebob theme song-so funny!! LCH had a hilarious rendition of “Heads, Shoulders, Knees and Toes” in which they changed the words to be the parts of a bug…Head, Thorax, Abdomen! Wabanaki sang the heartwarming song, “Imagine” by John Lennon. It sounded even more magical having Jacob play the guitar along with it! Camelot sang a funny original song! Shangri-La sang the sweet song “This Little Light” How beautiful! Fiddler’s Green sang the hilarious song about Hermey the Worm in which we found out why he was getting so big…he was eating camp!! In other news…tonight is cabin night! 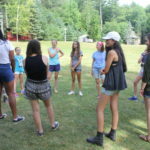 The counselors have been working hard to plan for this fun night in which each cabin does their own activity so they can bond and get to know their cabin mates more, to establish the cabin community. I snuck a peak at the list and there are SO many fun things planned for tonight! 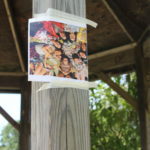 It’s always a surprise for the campers so…my lips are sealed! P.S. Here’s an update on what’s going on with the teens from Humming Bird! Hey all, Humming Bird here! 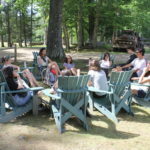 All’s well and good on Main Camp, but what’s happening with our Teen Programs? Well, let us tell you! 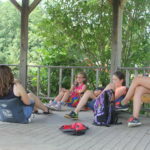 We have two Programs to report on this session: Adventures, which you may recognize from last session, and Alive– which is solely a second session Program! Adventures left this morning for their first excursion! 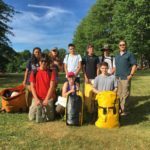 They’ll be spending the next 8 days on a canoe trip down the Allagash River! The 7 campers and 2 counselors will canoe and camp for the week, and I’ve been told this is the perfect time to be on the Allagash! Have fun, adventurers! We’ll give you more updates on the trip as they come, and we’re very excited to hear about their escapades! Our Alive program is just slightly different…. 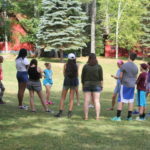 rather than canoeing and hiking and camping, the 9 Alive campers will be learning about and creating art in all its various forms! They have begun their time together by creating one collective mural out of painted tiles that spell ALIVE 2016! Last night they were initiated into the program when they received their sketch books, which they will use to document their session! Today they begin their advanced classes, stay tuned for more!! For now I’ve gotta go refill my water bottle– a bird’s gotta stay hydrated, too!! IT’S THE SNACK SCOTT! Here to tell us all about where and how to get snack!